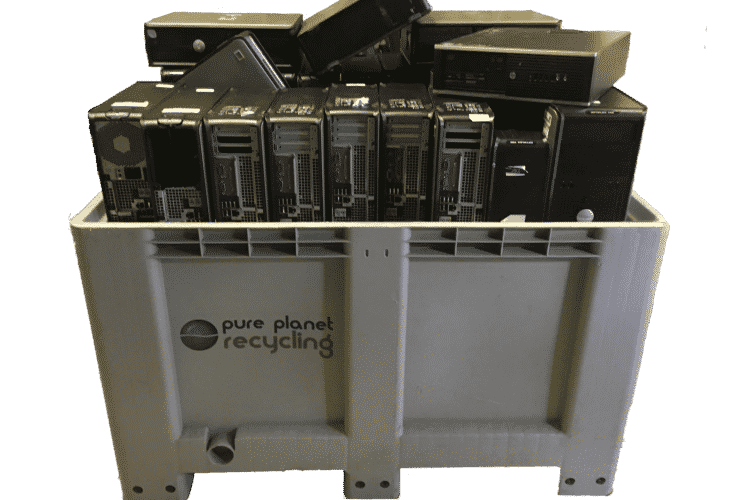 Pure Planet Recycling offers a computer recycling service to businesses, education facilities and local authorities. As a licensed Authorised Treatment Facility (ATF), we recycle many PCs and computers. We offer a secure collection service for computers and related hardware. Our trained, uniformed staff load the equipment into our own vehicles for treatment at our site. Our service ensures that your company receives an efficient and cost effective disposal of computer equipment. You can recycle such items as computers, laptops, and PCs knowing it is recycled ethically. Once the recycling is complete we issue a recycling report and data destruction certificate where necessary. We take data security very seriously and provide a full data destruction service when recycling your computers. Whether it is the destruction of drives, tapes or CDs and DVDs, we provide a secure and environmentally friendly service. For more information please see our data destruction services. How Is A Computer Recycled? 1. A visual inspection assesses if the computer is complete, undamaged and worth testing further. 2. Hard drives and removed, scanned and destroyed, via our hard drive shredder. 3. If a computer could have a use, it is fully tested and refurbished. 4. If our trained staff find faults we either, repair or decide that it is beyond economic repair. 5. Once refurbished, our approved suppliers reuse the working equipment in the UK. 6. We then dismantle older or non-working computers to separate the cd drive, power supply, motherboard and cables. This allows the plastic, ferrous and non-ferrous metals to be recycled separately. 7. We also remove any ownership identification labels or markings. This ensures that once we collect the equipment we become responsible for its proper treatment and recycling from that point onwards. For more information on how to recycle your computers please call us on 01234 315496 to discuss further.